Promotion Design More than 234,000 of New York City's top executives read Crain's New York Business, making Crain's an incomparable resource for advertisers looking to reach New York's influential business community. 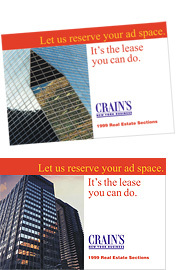 Crain's was seeking to push their advertiser promotions to new heights in attracting affluent developers and real estate professionals. Design Latitudes was retained to create, design, and photograph compelling digital images that convey a sense of power, elegance, and financial success. 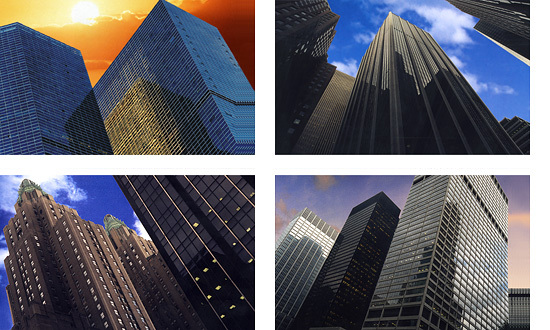 We produced a series of attention-grabbing and instantly understandable direct mailers featuring dramatic fresh new views of iconic Manhattan high-rises with surreal and highly improbable, but no less compelling, skylines.